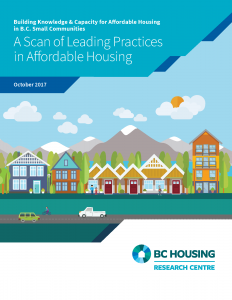 Creating more affordable housing in British Columbia is a hot topic these days, and many communities and individuals in BC appreciate the renewed focus on this issue from both the provincial and federal governments. Headlines, talk shows and debates tend to be focussed on larger urban centres and the recently introduced speculation tax, foreign buyer’s tax and school taxes on higher-assessed homes, and as a result there has been less inquiry into the many policy tools available to smaller communities. 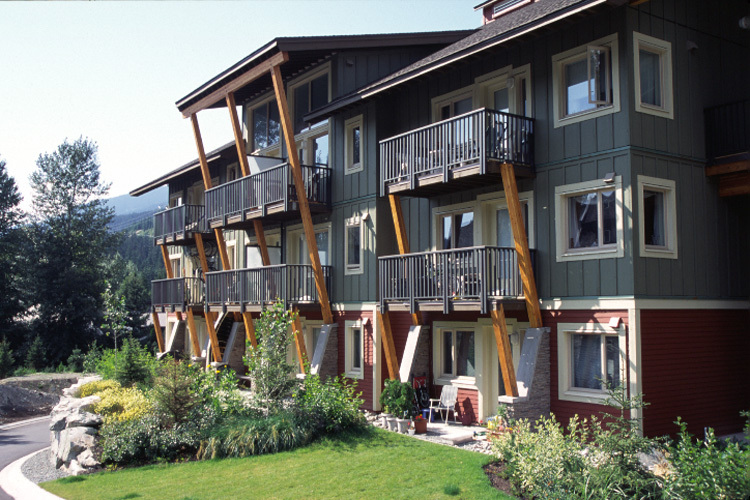 To address this lack on inquiry the Whistler Centre for Sustainability teamed up with BC Housing and an advisory committee of housing experts to scan the environment for the best affordable housing tools available to small local governments. What we quickly found out is that there is no “one size fits all” approach. For a smaller community bordering larger urban areas and experiencing population growth and development pressure, such as Squamish or Pitt Meadows, there may be tremendous opportunities to leverage tools such as housing fund reserves or density bonuses to encourage affordable housing. For an aging community with little to no population growth such as some of the smaller communities in the Kootenays, the affordable housing issue is often more of a mismatch on the type of housing available. Often older residents living in single family homes are faced with a lack of seniors housing or other ‘downsizing’ choices and therefore can’t sell and free up their homes for younger or new residents. For these communities a starting point might be to start a local seniors-focussed housing organization or to join a regional organization already in existence to help get the ball rolling. tremendous growth pressure is matched with policies to manage development for the protection of natural attractions, quaintness and municipal infrastructure capacity. So you see, “one size really doesn’t fit all.” To further explore this topic we have secured additional funding from BC Housing to continue our work with small communities in the coming year to further explore the specific tools that work best in different types of communities, and to share those learnings through workshops. 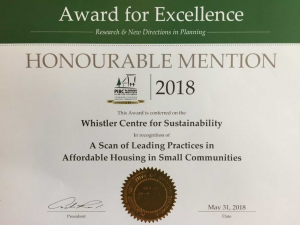 “A Scan of Leading Practices in Affordable Housing in Small Communities” received honourable mention at the 2018 Planning Institute of British Columbia (PIBC) Awards for Excellence.